Etching on with narrow margins, (size of sheet) 30.2 x 37.7 cm. 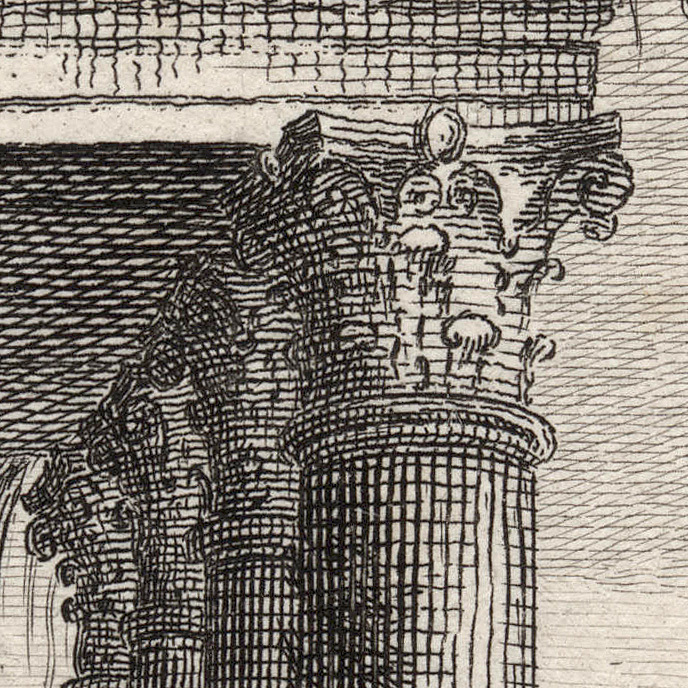 Condition: superb richly inked impression with narrow upper and lower margins and cut on the plate edge at left and right sides but still retaining the complete image; otherwise the sheet is in very good condition for its age. 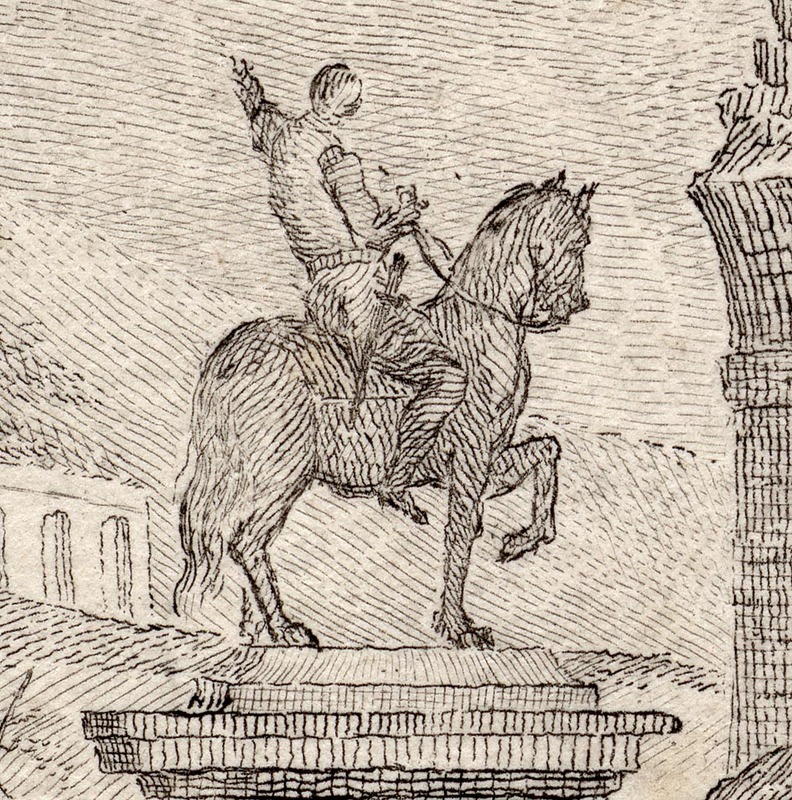 There are remnants—paper and minor glue stains—of past mounting (verso). 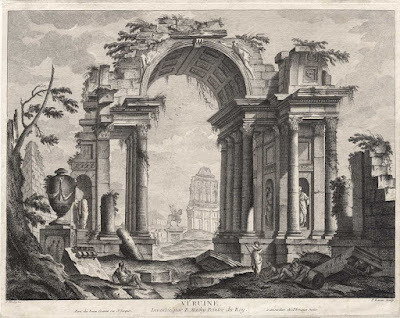 I am selling this historically significant and visually arresting view of Roman ruins executed in the 18th century for AU$133 in total (currently US$98.48/EUR89.34/GBP73.54 at the time of posting this listing) including postage and handling to anywhere in the world. 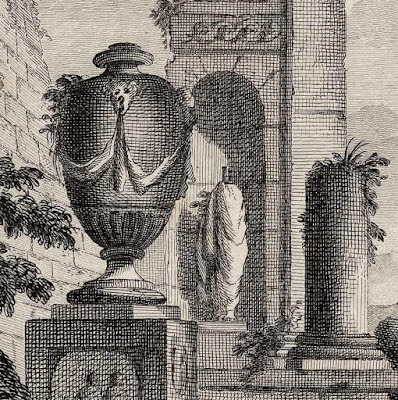 If you are interested in purchasing this quintessential 18th century fantasy of what architectural ruins should look like, please contact me (oz_jim@printsandprinciples.com) and I will send you a PayPal invoice to make the payment easy. 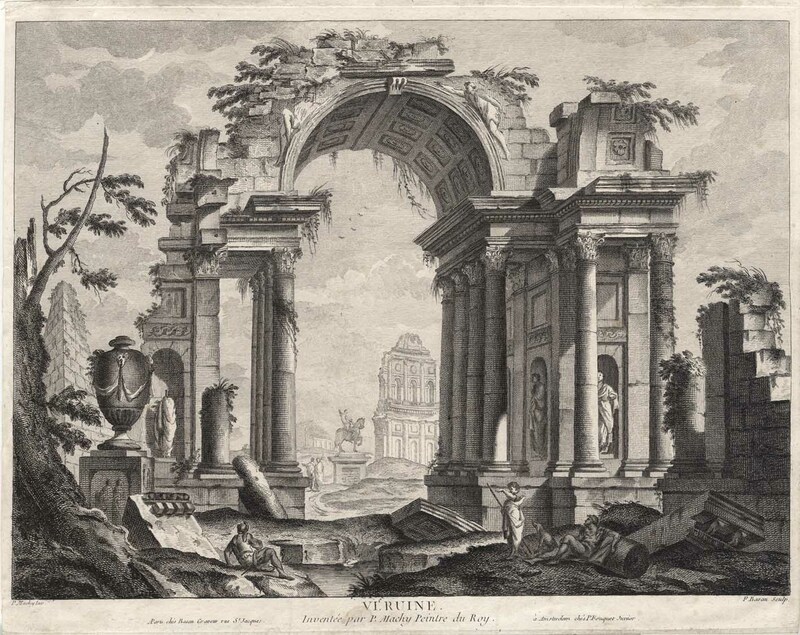 At the time that Pierre-François Basan (1723–97) was translating Pierre-Antoine Demachy’s (1723–1807) design into this etching, there was a strong interest in ancient ruins for the print buying public. The interest was not so much in seeing meagre bits of architectural remains, what the public wanted to see were remnants of architectural magnificence. Moreover, where the glory-days of portrayed site could be comprehended and the “feel” of the ruins could be experienced. 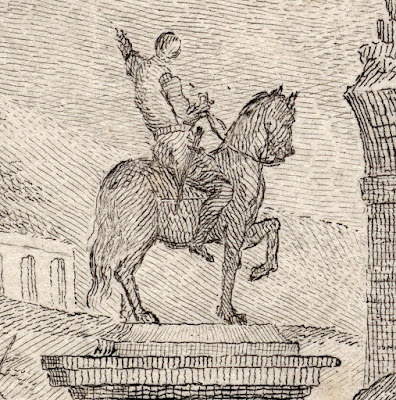 This desire naturally led many of the documenters of what could be seen in the various sites to add a dash of theatrical splendour to their depictions. 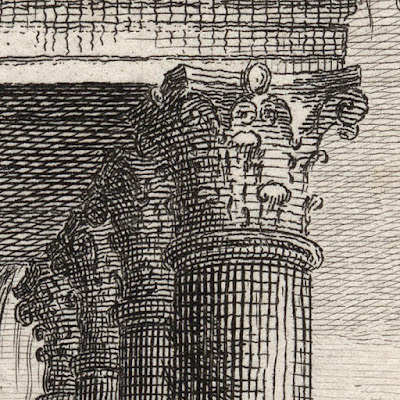 Even the most famous of these (pseudo) scientific documenters of what could be seen at the various ruins, such as the amazing Giovanni Battista Piranesi (1720–78), goes further than simply depicting the forms. For instance, they added drama to their portrayal with strong lighting and curious viewpoints. 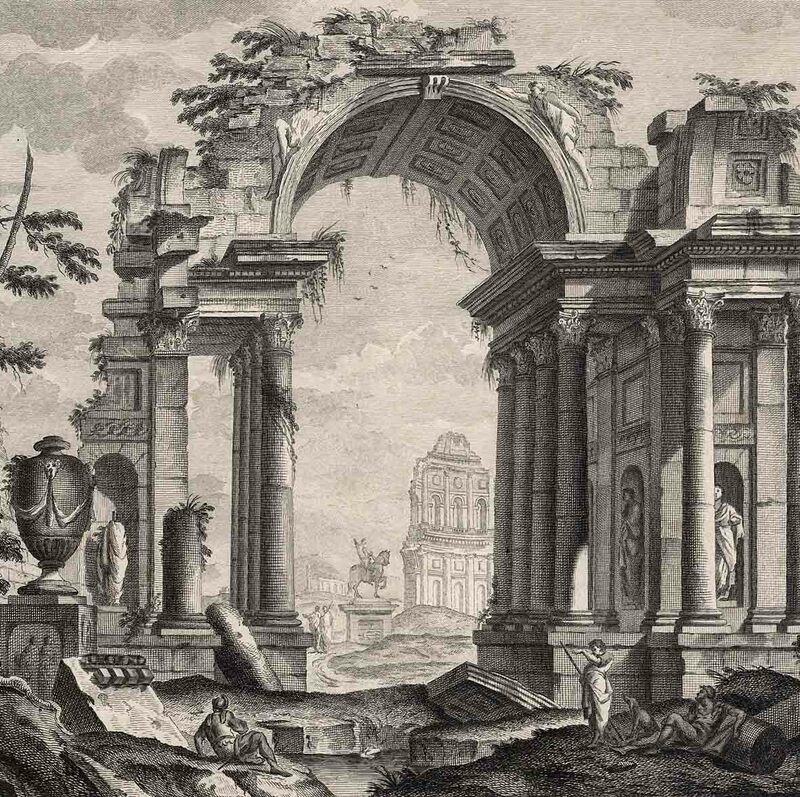 Going further, they also project the idea that the featured architecture is in a state of transience (the notion of vanitas that was popular at the time) by focusing on cracks, crumbling edges and vegetation taking root within stonework.